We'd like to introduce you to our Warrior Support Team™ (WST) manager and assistant managers from the East Coast, serving the Walter Reed National Military Medical Center (WRNMMC)—also known as "Bethesda." The Warrior Support Team-East is led by manager Susan Kristol and assistant managers Mary Ann Schilling and Peggy Densford. 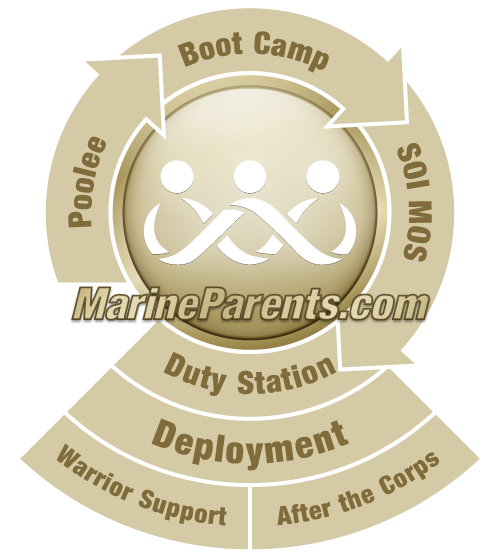 Manager Susan Kristol got involved with MarineParents.com through the organization's message boards and website as soon as her son started on the path of becoming a Marine. She found this an invaluable way to connect with other parents going through a similar experience. Susan began volunteering at Walter Reed National Military Medical Center in Bethesda, Maryland, in 2010. Susan and her husband Bill have three married children: two daughters who are enthusiastic Marine supporters, and their Marine son, a former infantry officer who is now in the reserves after a deployment in Afghanistan and a deployment on the 15th MEU in the Persian Gulf region. They also have three grandchildren who are proud to support Marineparents.com by sporting items from the EGA Shop's baby clothing department. Along with her team of dedicated volunteers, Susan aims to provide a welcoming presence at the hospital and to make sure that military families know there is a network of people who care about them. Thanks to the generosity of Marineparents.com supporters and sponsors, WST-East serves about 160 meals a month. Volunteers also distribute books, adapted clothing, and other resources to increase the comfort of the patients and families, and are on call to help the Marine Corps Liaison Office, often teaming with other benevolent organizations, with special events on base such as the annual Super Bowl party, occasional lunches at Fisher House, and welcome and farewell picnics. Warrior Support Team volunteers, through the generosity of Marineparents.com supporters, also provide new baby gifts, Thanksgiving dinner supplies, Mother's and Father's day coffee mugs and refreshments, and gifts for the Christmas bazaar at Tranquility Hall. Assistant Manager Mary Ann Schilling and her husband Paul have been helping to serve meals to wounded, ill, and injured service members for over five years. They have two daughters. Their older daughter served two tours in Iraq as a Marine. Mary Ann was looking for a way to help the troops in an effort to overcome how much she missed her own daughter who was deployed. While searching the internet she discovered MarineParents.com's™ Purple Heart Hero Support™ (now the Warrior Support Team) right in her own backyard! Mary Ann is the volunteer who lives closest to Bethesda, so she's the one who is always running over to hang posters and signs encouraging folks to come to the dinners, and when there is a snowstorm on a WST meal day, it's Mary Ann who is always the first one there to make sure that the families still get served! Assistant Manager Peggy Densford and her husband, Joe, are the parents of three children: a daughter and two sons. Both sons are Marines. When Peggy and Joe's older son deployed to Iraq for the first time, they became volunteers with MarineParents.com. They travel from their home in St. Mary's County, Maryland, to the Walter Reed National Military Medical Center in Bethesda, Maryland, once a month to serve meal to wounded, ill, and injured warriors and their family members and caregivers. Supporting families of other Marines, sailors, and soldiers helped ease the helplessness they felt with their son in harm's way. MarineParents.com is fortunate to have an extremely dedicated and compassionate group of WST volunteers serving meals at Bethesda. Their smiling faces and positive attitudes help our wounded, ill, and injured service members, as well as their family members and caregivers, during the recovery process. The Warrior Support Team-West is made up of Marine Parents volunteers, staff from the corporate office, and staff from the Wounded Warrior Battalion-West (WWB-West) at the Naval Medical Center San Diego (also known as "Balboa"). Long-time volunteers with our previous outreach program at Balboa, Purple Heart Hero Support™, Dale Larson, along with his wife Lori, are our on-site managers. In 2013, as a member of Team Marine Parents™, Dale ran two half marathons. The Larsons' dedication to supporting Marines is an inspiration to all who meet them. Today, as the Warrior Support Team, we serve the residents of the wounded warrior barracks, upwards of 70 patients at a time, every Thursday afternoon for dinner—week in and week out! The Larson family works closely with the staff at both MarineParents.com corporate office and Balboa to arrange meal delivery from local area restaurants. The patients are happy to grab dinner and spend time visiting with one another in the Liberty Center.